Wrinkles may form on a person as he or she ages. These may start to look unsightly. The same goes for frown lines. Such people might opt for a brow lift to correct these issues. Coronal Lift – This is one of the common type of brow lifts requested. Also known as an open brow lift, a coronal lift involves a continuous incision that starts behind the brow line and extends to the ear. Huntington Beach female patients who have smaller foreheads are often recommended the surgery. Mid Forehead Lift – This is designed for people who have wrinkly foreheads and sagging brows. The brow lift is performed by making an incision along these areas on the forehead. Next, the surgeon removes excess skin and fat. Since the tissue that surrounds the area of the incision is loose, it spares the surgeon from removing too much skin from the patient’s brows. Direct Brow Lift – This particular brow lift is unique since it isn’t meant to remove fine lines or wrinkles at all. It is often performed on make patients who have male pattern baldness or older patients looking to raise their hairlines. During a direct brow lift, the surgeon removes the skin and muscle that is situated above the eyebrows. This is done by making a small incision. Temporal Lift – Also known as a lateral brow lift a temporal brow lift is a minimal procedure that is meant to improve the appearance of one third of the outer portion of the eyebrows. This enlarges the eyes. During the surgery, small incisions are made which reduces risk. A temporal lift is performed under local anesthesia and might be accompanied with an endoscopic lift. Endoscopic Lift – This is a more advanced form of a brow lift. During this procedure a small camera is inserted into one of several incisions. The camera allows the surgeon to view the interior of the tissue. Next, incisions are made on the patient’s hairline. This is an advanced technique that allows the surgeon to lift the brows without cutting the skin from one ear to the next. Not only does this result in a natural look it also speeds up the healing process. Trichophytic Lift – This particular procedure is often recommended for Huntington Beach patients who have higher hairlines. The incision that is made is only 4cm long. Rather than moving the hairline, the surgeon removes the skin. This is done to elevate the eyebrows with the help of an incision that is made in the hairline. As a result, a trichophytic lift lifts the eyebrows and reduces wrinkles on the forehead.A brow lift can be performed at a surgeon’s office under local anesthesia. Patients may also request for general anesthesia if they prefer to stay asleep during the procedure. The surgeon will close the incisions with staples or stitches, clean the area and apply bandages as soon as the surgery is over. The time of recovery varies according to the type of brow lift that is performed. The stitches or staples will need to be removed within a week in either case. Temporary fixation screws which are placed underneath the hairline to keep the brow elevated are removed after two weeks. The swelling and bruising may go down after a week has passed. Huntington Beach patients should keep in mind that the swelling may extend to areas where the surgery wasn’t performed such as the cheeks and eyes. They might also be told to keep their heads elevated for a certain period of time to ease the swelling. Ice packs may be affective in keeping the swelling down. Patients may also be advised against engaging in physical activities such as exercising or contact sports. Depending on the type of procedure that is performed, patients may resume work or their daily responsibilities within 10 days. It is important to note that a brow lift will depend on a patient’s gender as well. Women typically have thinner eyebrows which are situated higher above their eyes. In addition, they have no prominent bony ridges and have curvier foreheads. Huntington Beach male patients on the other hand, have thicker eyebrows which are situated lower above their eyes. They often have bony protrusions above the eyes as well. 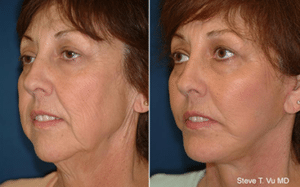 These differences ultimately affect the appearance that the surgery achieves. This is also why brow lifts need to be tailored accordingly. According to a 2014 statistic from the American Society of plastic Surgeons, a brow lift may cost around $3,021. This cost is not inclusive of the expenses that are associated with anesthesia or operating room facilities. The cost of a brow lift may be more if it is accompanied by other types of cosmetic procedures such as a facelift or double eyelid surgery. It is important to remember that health insurance does not always cover cosmetic procedures. There needs to be a medical reason for insurance companies to cover part or all of such procedures. Huntington Beach patients are advised to consult with their doctors and insurance companies to determine whether their surgeries will be covered. This will help them determine whether they need to pay for part of the cost or all of it themselves. For more information on brow lift, contact our office in Huntington Beach at (714) 848-1133.